Gemini, in 2018 you will focus on relationships. Indeed, your entire life is actually just a set of connections with others, and if you were on a desert island without any friends, you would probably be pulling out your last hair after the first week of loneliness. You are a social being and there is hardly anything you can do about it. Nothing lasts forever, and you are more and more aware of it. Gemini, the horoscope indicates a desire to slowly but permanently settle down or at least temporarily anchor in some quiet and safe harbor. It is tempting to set out straight ahead the first thing in the morning to meet unexpected adventures, but when you do not know where to lay down your head in the evening, you will soon cease to smile. Courage is appreciated now, but so is steady environment. 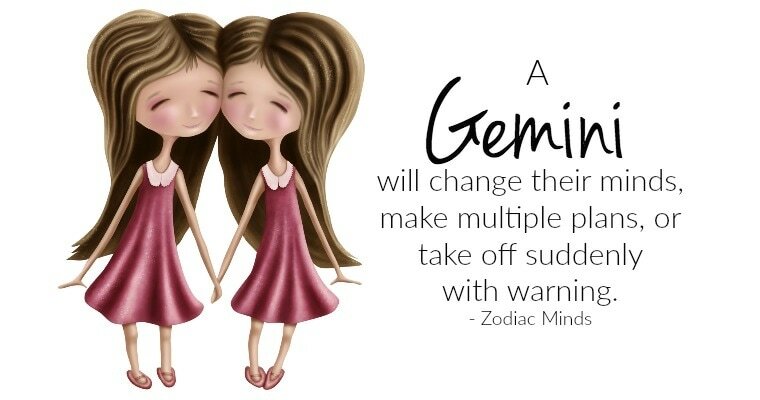 It is also obvious that Gemini is walking in the right direction in life. You should, however, be cautious because thanks to your passionate nature you will easily start any action with 110% dedication but it is logical that under such circumstances a potential injury can be soon expected. Although you may be driven forward by love or by the fresh smell of mountains, try to keep your feet firmly on the ground. The horoscope predicts the magic lucky number. It will bring good luck to Gemini, and the number is – four! If you want to buy more than one pair of socks, definitely buy four! Just joking, of course, but please do not underestimate the positive impact that this number may bring you in everyday affairs of the 2018. Four flowerpots on the windowsill are better than three, as well as dinner for four can often be more enjoyable than just for two or even one. In 2018 you will care a lot about what impression your face gives. According to the horoscope prediction Gemini wants to be in the spotlight. Cosmetic treatment or plastic surgery may give many promises, but you should know that a smile does not cost anything and yet its effect will be of the utmost importance. A good mood is contagious and so is the bad one. Gemini should set the proper “tone” to others! Peace is something what is not entirely inherent to Gemini. But the love horoscope for 2018 predicts a very strong need to slow down or even to stop and to take a break mentally. Gemini, talk less and listen more. Think about what others say. The proverb “speech is silver, silence is gold” should be a central theme of the Gemini’s love. Your talkative nature is similar to the rain. A little moisture is definitely good for the harvest, and even a small verbal “shower” may only strengthen the relationship with Gemini’s counterpart. In 2018, however, the constant “streams” of sentences pouring from your sweet mouth may bring the unexpected emotional “flooding” and acid (unripe) fruits at the end of the romantic season. ​The love of Gemini may, according to the horoscope, remind a fireman’s fight with a forest fire. Your sensitive heart will ignite easily if someone decides to camp on its territory. The soul of Gemini is not a cold fortress equipped by high walls, defending it against all sorts of attacks. Your gentle and delicate soul is rather close to a vast countryside, which other people gradually pass through and which is transformed by their actions. In 2018, it will depend on the fortune only partially: who will appear in your way and which direction you will send him or her? Will it be the shortest path outward or the winding road into the mysterious forests of your deepest soul? The Gemini will decide!